The study design was to collect various items from three hospital groups (one in Wales, one in Scotland, and one in England). The collection of items was not strictly standardised – they were a collection of different items from different hospital specialities. The presence of biofilm was established by rinsing the samples thoroughly to remove unattached bacteria, and then broth culture to grow what was left. 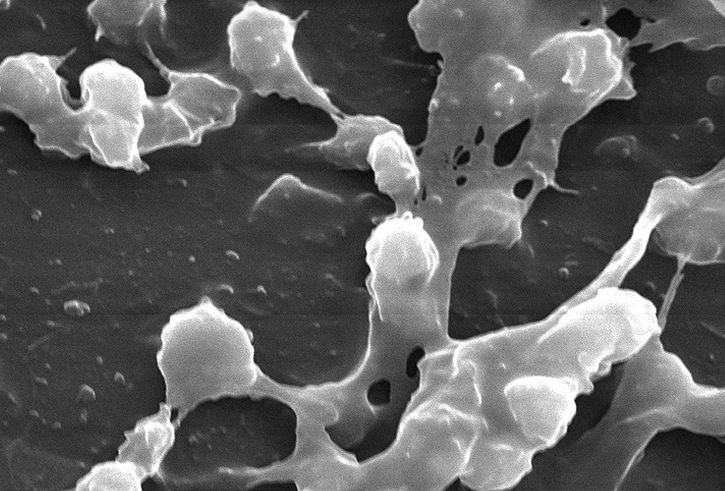 SEM confirmed visually the presence of dry surface biofilm. Overall, dry surface biofilm was detected on 95% of the 61 samples included in the study. It was interesting that the DNA composition of the biofilms varied by hospital: two hospitals contained mostly staphylococcal DNA, whereas more Bacillus DNA was found on surfaces from the third hospital. The clinical significance of this part of the study is not clear, and it could be explained simply by sampling differences (e.g. in the type of sample or where in the hospital they were collected from). However, the difference could also be due to variation in cleaning / disinfection policy or practice, which would be more important: could our management (or otherwise) of the ‘environmentome’ modulate the chances of transmission? I’m pretty sure that the presence of dry surface biofilms on hospital surfaces is an important contributor to the finding that the prior room occupant can influence an incoming occupants chances of acquiring pathogens that cause HCAI. Dry surface biofilms drive extend the survival of vegetative bacteria on surfaces, and bacteria in biofilm mode are considerably more resilient to being removed through cleaning or killed by a disinfectant. And, as this study shows, they’re more or less universally present on dry surfaces in hospitals. So: Beware Biofilms! ← Novel strategies in science communication: Fiction or future? Absolutely. Good to see increased focus on biofilms on dry surfaces, and awareness of limitations of disinfectants on these.